Training apples and pears as espaliers is a space-saving way of growing fruit on a wall or fence. They require little pruning once established and are attractive in blossom and fruit and architectural during winter. Ornamentals such as Pyracantha are sometimes trained as espaliers. Apples and pears that bear short fruiting spurs (not tip bearing). This method may also be used for ornamental wall shrubs such as Cotoneaster and Pyracantha. Trees may be purchased with one to three tiers already formed or grown from one-year-old trees (maidens). Firstly you need to establish a training system against a wall or fence. Erect horizontal wires 35-45cm (15-18in) apart between posts, or straining ‘eyes’ on walls or fences. Trees should be planted 3.75m-6m (12-20ft) apart, according to their vigour. 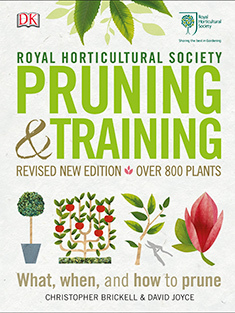 See our advice in trees and shrubs: planting for more information on planting trees. Remove the blossom in spring, for the first three years, so all of the energy goes into plant growth. Trees should be pruned annually as growth slows down in August. Renovation pruning for restricted forms of apples and pears should be started in the winter, followed by summer pruning the following year. In order to reduce over-vigorous regrowth, it should be carried out over 1-2 years. Clusters of fruit buds may need to be thinned after seven or eight years; alternatively, a few can be done each year in the dormant season (November to March), reducing over-complicated spur systems to one or two fruit buds. In mid-to-late summer, chip budding can be used to replace missing arms on apple or pear espaliers; this process involves grafting a chip of wood with a live bud beneath the bark.